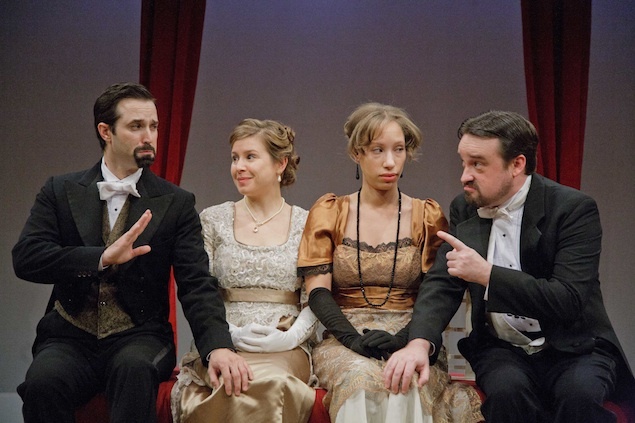 Two one-act plays by George Bernard Shaw explore the tricky nature of love and courtship. Nick DePinto, Rana Kay, Dawn Thomas, and Michael Glenn in Overruled. Photograph by C. Stanley Photography. to eventually fall in love. Overruled, with a different director taking the helm for each play. Laura Giannarelli does her best to keep things well paced. Alan Wade treats the play as a borderline farce, and as a result it takes a few minutes to settle into the performers’ rhythm. another would-be couple, Sibthorpe (Glenn) and Mrs. Lunn (Dawn Thomas), arrive on the scene. husband and men who are in love with me,” says the arch Mrs. Lunn. Village Wooing ably demonstrate courtship as a kind of dance, and both directors prove to be able choreographers.